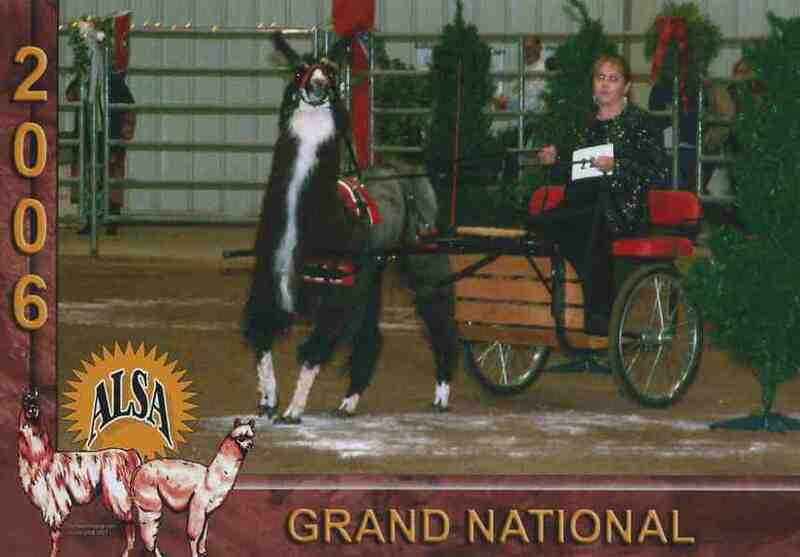 Eagle and I won the ALSA Grand National Driving Champion again for 2002, 2003 & 2006 in Lincoln Nebraska. 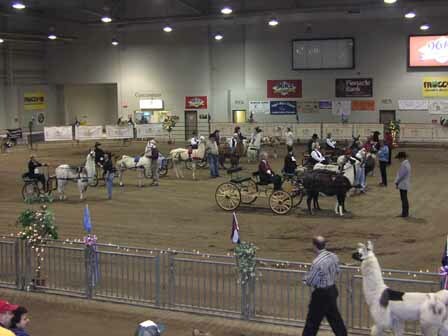 There were 10-12 llamas (the first few years) in the classes each year and he performed beautifully with his gait changes, backing and other requests. In 2006 Nationals added Obstacle Driving and we won that too! 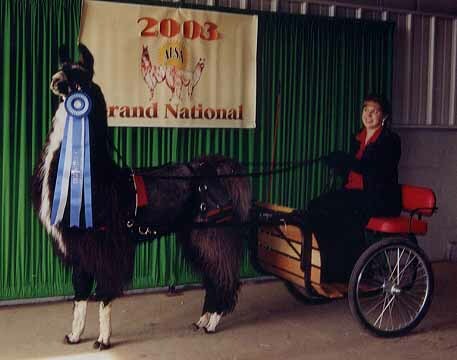 Eagle is the ONLY llama to win driving at the Grand Nationals four times in full class competitions with the person that actually trained him. We were very proud of him! Eagle is the top driving llama of all time. To this day, no llama has been able to perform at the level and precise quality he did. Eagle could do lead changes, walk, trot and lope in a figure eight and his transitions were smooth. He was the best! Eagle has many offspring that are exceptional driving animals and his two half brothers are also amazing drivers. Eagle's contribution to driving with llamas can not be emphazied enough. Eagle's daughter NH Flight of the Eagle (Isle Eagle x NH Domineaux) was the 2011 "ILR Gathering of Friends" 1st place Adult Showmanship, Pleasure Driving, Public Relations, Obstacle and Pack win. 2011 ILR Gathering of Friends Advanced Performance Champion. The Eagle Cart we use is powdercoat painted, the shafts remove (stems that go between the llamas body) for show travel, the seats are waterproof marine fabric (come in red, purple, black and hunter green), wood flooring, backrest, wheel axel flips for added height for taller llamas, large wheels for going on uneven surfaces, back bumper guards to protect the seat and much more! For order information, contact Llamatopia of Montana.